Order in next 4 hours and 29 minutes for despatch today. Long Thonging replacement zip tag in cerise. If you are unfortunate enough to lose the leather zip pull from your handbag, there is no need to throw the bag away, simply choose the correct replacement from our large range of genuine Radley parts. 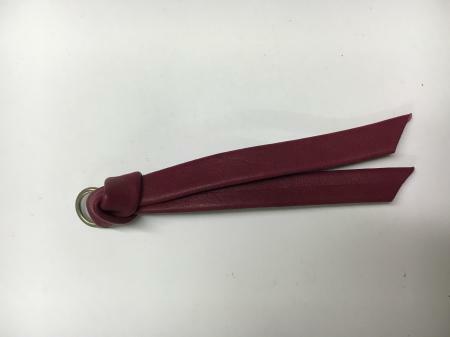 This 9cm leather replacement zip tag is in cerise leather thonging. It comes with a nickel split dee ring. To fit this Radley zip tag you will need a pair of needle nosed pliers, firstly to open up the dee ring and then to pinch it closed. If your repair job is more complicated, register so you can use our on-line repair quotation service, we can repair most handbags.